There are 5 different types of pins in the advent calendar. 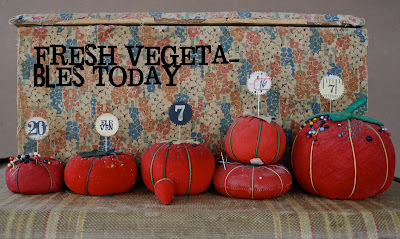 You can choose how many of each to make. I started with the pins made from the 7gypsies Measurement paper since the numbers are limited to the numbers on the paper. All the number pins are made with the same Martha Stewart punch pictured (Michael’s) and long quilters pins. 1. Punch one circle of music paper and one of cardstock. 2. Use a glue stick (I prefer UHU) to combine the two papers. The vintage music is very thin and the pin needs to be sturdy so the cardstock is important. 3. Stamp number using black StazOn ink or Archival (Ranger). 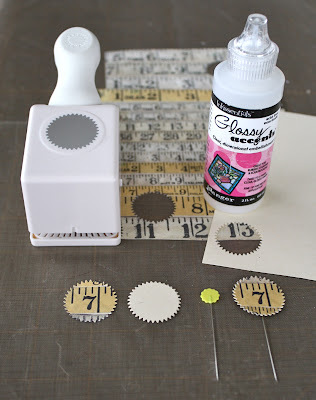 The stamped numbers are from the 7gypsies clear stamp-Baby...I know, I know it’s baby but the numbers are just the right size and font for almost every project. 4. Use a blending tool to ink edges of the circle with Distress ink-Vintage Photo (Ranger). If your pad is brand new you will need to blot off some of the ink on a paper towel before applying to edge. Best to test on a piece of cardstock first. 5. Add a bit of glue to the head of the pin and adhere circle. NOTE: I like Glossy Accents (Ranger) because it’s thick (so it stays in place), easy to apply (nice tip), and quick drying (just apply pressure for about 30 seconds). 1. Print out number on creme cardstock. I used the font Jailbird Jenna. You can get it for free here. My friend Rachel found this one and now I love it so much I want to marry it. Super fun to play with! 2. 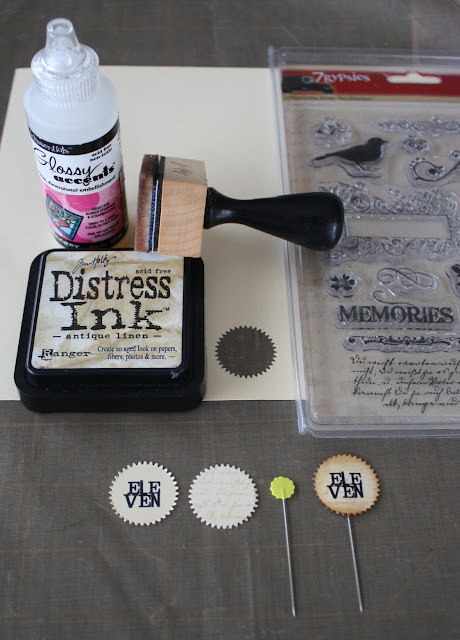 Punch out number, then stamp over the image with the script stamp found in the 7gypsies clear stamp-Nottinghill. The picture shows another circle with the stamp-this is for demonstration purposes only. You do not need to punch 2 circles just the one with the number. NOTE: This same stamp is used repeatedly throughout the advent calendar for backgrounds. 3. 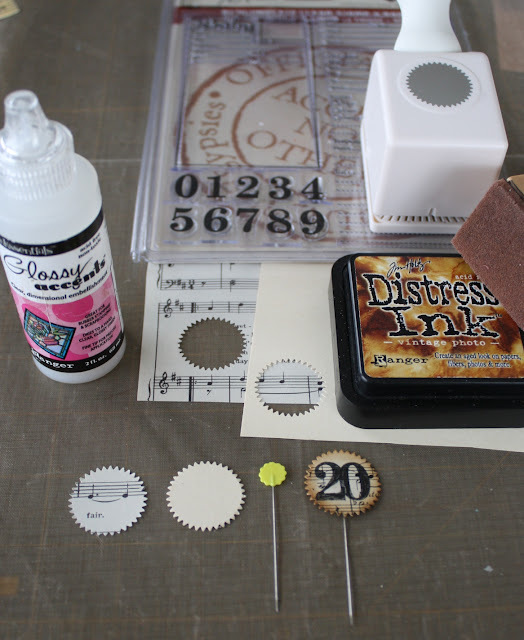 Use a blending tool to ink edges of the circle with Distress ink. 4. Add a bit of glue to the head of the pin and adhere circle. 1. Punch circle from good black cardstock (Bazzill) is my favorite. 2. Stamp the number you need with Brilliance ink-galaxy gold (Tsukineko). I stamped the image twice to get better coverage. This ink dries fast and has a great metallic appearance unlike other inks that just fade into the papers. 3. Add a bit of glue to the head of the pin and adhere circle. 1. 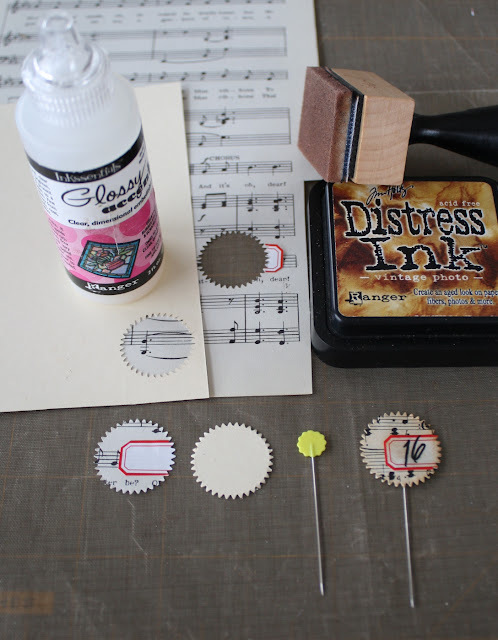 Add a small label sticker (mine are vintage) to a piece of music paper. You must add the label before you punch to get the sawtooth edge. 2. Punch one circle of music paper and one of cardstock. 3. Use a glue stick to combine the two papers. 4. Use a blending tool to ink edges of the circle with Distress ink. 5. Use a black pen (I prefer an American Crafts Precision pen-01 or 03 for such small spaces) to write whatever number you need. 6. Add a bit of glue to the head of the pin and adhere circle. 1. Punch one circle of number paper and one cardstock. 2. Use a glue stick to combine the two papers. NOTE: In the paper I used, there were no numbers in the 20’s to punch so I cut a 2 out with scissors and glued the piece over the 1 in the number 12 to make it 22. You would never be able to tell if I didn’t point it out. So that's it for the number pins...all are very easy once you see the pictures. Please email me if you have any questions. A few people have emailed me to ask about kits for this project. I will kit a limited amount of basic essentials for the Advent. Thirty #8 tags, 25 quilters pins, 3 colors of seam binding ribbon, 2 vintage music sheets, Digital PDF files of ephemera used (that you can print out on cardstock at home), 1/2 sheet of the discontinued Measurement paper and maybe even a bit of glitter. The kits will be up in the Etsy shop by Wed for shipping on Monday Dec 21st. I love this project! My resolution for 2010 is to be a better hoarder so I have goodies for projects like these! I LOVE this project. I'm going to leave myself a voicemail at work to get my kit on Wednesday so I don't forget! Great blog, tonight was my first time visiting. I'll be checking back in for sure! I'm in Australia and I've been trying to find details of the Martha Stewart punch, which isn't on her site. Are you able to provide its number, name etc so I can see if I can find it. Thank you so much. Maybe it's your LUCKY DAY! Has anyone seen my desk?